The weather has been beautiful again recently. On the news tonight they talked about how crowded Stanley Park is and how many people are flocking to the beach! It's hard to believe it's still winter, isn't it? When I was driving home on Friday I saw a lady using an umbrella as a parasol. Now, this isn't an entirely unusual sight here in Vancouver but I particularly noticed her for all the wrong reasons. I really wish I could have taken a picture but I couldn't because I was behind the wheel and it was only one of those 5 second opportunities. Anyway, let me paint you a picture. She was using a very small umbrella. It was a solid navy blue and one of the tips was off, so the one rib was poking out. Forget the fact for the moment that it wasn't stylish; it wasn't effective either. First of all, if you're going to use an umbrella to do double duty as a parasol, you should at least use a light coloured one! A slightly bigger umbrella would have protected her from the rays better too. It doesn't have to be a golf umbrella, just a decent size. The one she was using wasn't much bigger than a child's one (and cheap to boot with ugly blue plastic tips) but I can't imagine anyone marketing such a blah colour for kids. And then there was the damage. In a crowd you might actually run the risk of poking someone with that exposed rib and the material wasn't stretched properly so it wasn't protecting her as well as it could have done. All I could think about was, if she'd bought the umbrella at The Umbrella Shop, she could have gone in and gotten it fixed. Sewing repairs are free and other basic repairs cost $5! It would have looked so much nicer then, but it would have still been all wrong for a parasol. I've never really done it, but I love the idea of using a parasol. I burn easily, then peel and burn again so I try to stay out of the sun. I know I ought to use sunscreen all the time but it's a habit I really haven't been able to develop. I try every so often but I really hate wearing all that goop on my face. But a parasol. How elegant that sounds. Maybe I'll try it this summer. 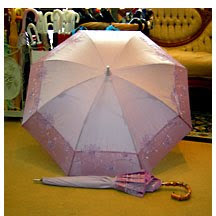 I went searching online, knowing that the kids do sell some parasols and I found the perfect one for me! I adore all things Victorian, purple is my favourite colour and I grow lavender, so when I saw this one came in lavender I just had to click! What do you think?